Not 30 years ago, there was no evidence of any planet outside our Solar System and now over 3,400 such worlds have been confirmed. These include dozens of Earth-sized –many orbiting in the “Goldilocks zone” of their star, locations where temperatures allow liquid water, if the planetary atmosphere is right– and the number is growing. 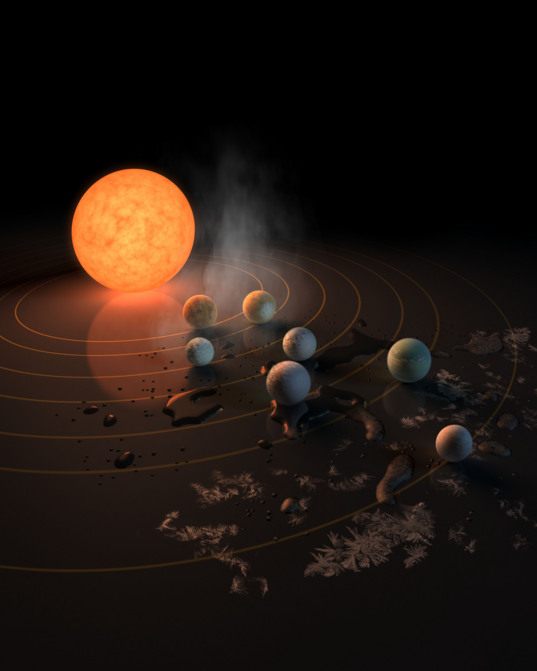 Last Wednesday, NASA announced the discovery of SEVEN planets orbiting a star just 39 light-years away called TRAPPIST-1, all with a planetary radius similar to Earth’s. This is unusual since most known planets are massive gas giants like our own Jupiter, Saturn, Uranus, and Neptune, but smaller, rocky planets produce environments that are more plausible for the origin and presence of life forms. The first known system of seven Earth/Venus-sized planets orbiting the same star, the new findings come from Belgian astronomers using NASA’s Spitzer Space Telescope and debuted February 22 in the journal Nature. To be precise, the announcement and the paper in Nature concern how the Spitzer findings confirm the presence of five planets around TRAPPIST-1, adding on to two other planets discovered earlier this decade by researchers using what’s called TRAnsiting Planets and PlanetesImals Small Telescope (TRAPPIST), of which there are two, one in Chile, the other in Morocco. The Belgian team using Spitzer was led by University of Liège astronomer Michaël Gillon. During the press conference, Gillon noted that he’d been motivated, early on, by an interest in the search for extraterrestrial life, and thus initially had considered a career in biology. Perhaps based on discoveries of exoplanets occurring the early 1990s and new instrumentation on Earth and in space, however, Gillon proceeded instead into an astronomy career, but the astrobiology community is gearing up to consider the findings and this will accelerate as new instruments reveal information on the atmospheres of these newly discovered planets. With this in mind, let’s take a look at TRAPPIST-1 and its seven planets. 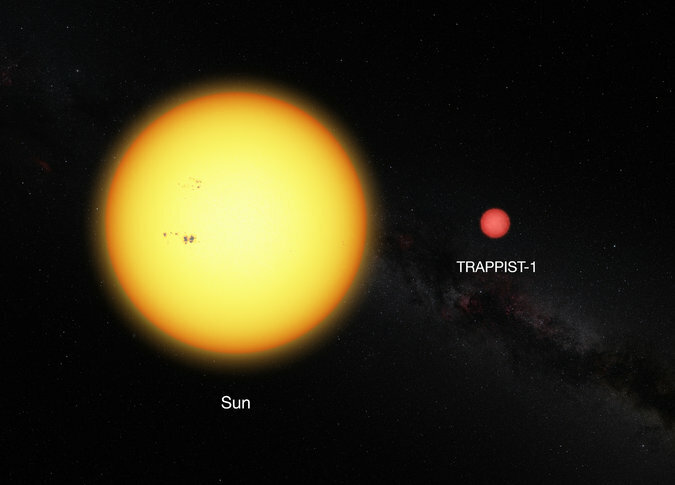 TRAPPIST-1 is a red dwarf star, so it is small and dim compared to the Sun. This means a planet must orbit much closer to TRAPPIST-1 than Earth, Venus, and Mars order with respect to the Sun, to receive a comparable amount of light. A closer orbit means a faster, quicker orbit. All seven planets orbit so closely to TRAPPIST-1 that a “year” corresponds to no more than a few Earth days. Since they are so closely in, however, astronomers suspect that the planets tidally locked to the star, keeping the same side facing the star (and thus in daylight) through each orbit. For a planet with no atmosphere, this would make the daytime hemisphere hot and the nighttime hemisphere super cold, but an atmosphere could spread the heat through wind and other phenomena. Astrobiology has a concept called the Goldilocks zone, given the importance of liquid water to the kind of chemistry that makes life possible on Earth, and, we think, throughout the Cosmos. Water oceans can exist deep down on icy worlds that are far from a star (like the moons Europa and Enceladus in our own system), due to tidal heating inside the world), but it is hard to send probes through the ice to look for life forms that may inhabit such an ocean and more challenging to detect evidence of such deep life across interstellar space. For this reason, the prospect of liquid water on the surface of a planet is vital to the search for extraterrestrial life. A planet orbiting either too close to, or too far from, its star will not have liquid water on the surface. In between those extremes is zone –not too cold and not too hot, like the porridge in the Goldilocks story– where liquid water is possible, so long as there is some pressure from an atmosphere. The needed pressure depends on how much salt is in the water; that’s why the discovery of perchlorate salts on Mars has been such a big deal. The size of the Goldilocks zone and its distance from a star depends on how hot the star is. 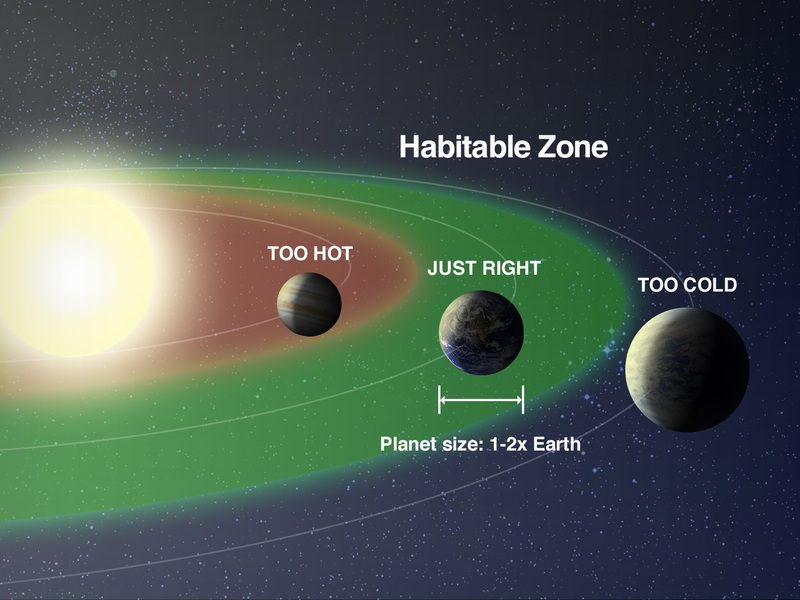 For the Sun, the Goldilocks zone runs roughly from the orbit of Venus to the orbit of Mars, so extraterrestrial beings looking at the Sun from another star system using technology comparable to what we have used so far to study TRAPPIST-1 would be very interested Venus, Earth, and Mars. They wouldn’t know that Venus has an atmosphere so thick and with so much greenhouse heating from carbon dioxide that its surface is too hot for liquid water, despite the fact that Venus is in the Goldilocks zone. When it comes to TRAPPIST-1, the Goldilocks zone is much much closer, and since the star is really small, the seven Earth-sized planets (their radii range from 75-110 percent that of Earth) are close together –really close. The distance between their orbits is only a few times the distance between Earth and the Moon. And since they are bigger than the Moon, this means they are seen in the skies of one another in circular, crescent, and gibbous forms, just like the Moon from Earth, rather than as points of light as we see Venus and Mars. TRAPPIST-1 is a mini Solar System. As shown in this NASA/JPL representation, the three inner planets of the TRAPPIST-1 system are probably too hot for liquid water, and the outer planet is too cold, at least for surface water. But we have three planets (called e,f, and g) in the Goldilocks zone. Their sizes and masses make them good candidates for having atmospheres. With instruments already available on Earth and in space, astronomers are figuring out all kinds of specs on the TRAPPIST-1 system, but there is a lot more to come. With new instruments, such as the James Webb Space Telescope set to launch into space late next year, scientists will be able to look at atmospheres of these planets, and others. From across interstellar space, they’ll be able to determine whether certain chemicals are present that can act as signatures for the presence of life. If you’re wondering whether the search for extraterrestrial intelligence (SETI) program has targeted TRAPPIST-1 to look for signals of technology, such as artificial radio transmissions, the answer is yes. Current thinking is that red dwarf stars are very good candidates not just for planets with life, but planets old enough to have life for billions of years. No ET signals have been detected, but the real excitement of this find is the sheer number of Earth-sized planets around one little star. It means that there are many others, that this is probably just the tip of the iceberg, that we can anticipate other such dramatic discoveries frequently in the years to come.